Working in a customer service industry infallibly means you have to deal with idiots. Imagine having to answer the same moronic questions over and over, having to deal with panic stricken customers who caused their own problems due to their lack of even the most basic common sense. I am such an idiot customer, and Andy the bike guy answered my inane inquiry with just a hint of sarcasm, showing an impressive feat of restraint. My shifter had suddenly stopped working, and I was stuck in my lowest gear in a retail park just outside of Fredrikshavn. My gear system is on the expensive side, bought for the purpose of having as little problem as possible, with the downside of being a special item not easily servicable on the road. I was a bit annoyed. I expected mechanical troubles on the trip, although maybe not after a couple of weeks, but carried very little spare parts. My logic is that, on such a long trip with no plan, I can order stuff and just wait for them in whatever quaint town or nice beach I am currently staying. I never thought about having expensive nonrefundable tickets for a ferry to Iceland, a ferry that wasn't going to wait for me regardless of my troubles. Before buying the gear hub I had done my research. I had read every review and countless blogs with real experiences. 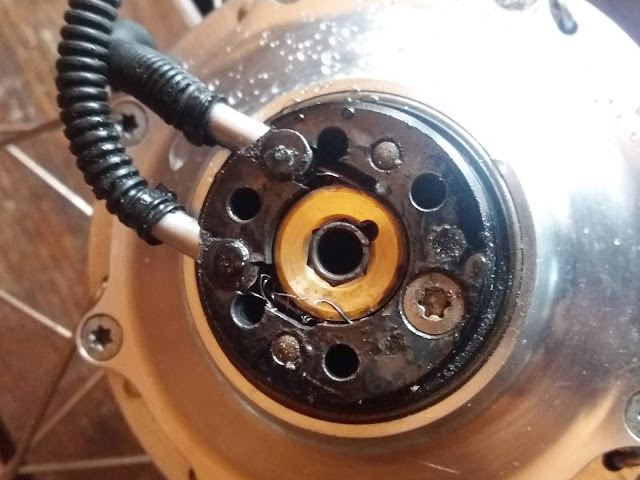 I believed the manufacturers claim of never having had a hub fail internally. What I had not done, however, was read the f*cking manual. I don't think I've ever read a complete manual my entire life, not even the ones I've written myself. When I sent the panicky email it was with a feeling of despair and irritation, miffed about having one of the very few broken hubs. When I soon thereafter got the reply from Andy the feeling changed into a different one, the far too familiar feeling of "Oh, that thing I was supposed to remember. My bad". The sudden realization that I am an idiot. When did I last change what? Never, that's when. No, I don't have one of the spares recommended, but now that you mention it I think I have read in passing that I am supposed to do something like that. I remember reading about it several times both when I researched before purchase, and during the five years I've been riding the thing. I recall thinking it might be something important I should deal with and I remember thinking I should probably look into it. Look into it later. But instead I procrastinated. I probably had a beer, or read an article about superheroes, or something. Now, here I was with an unrideable bike lacking spare parts so special almost no bicycle shop carries them. Some emailing and phone calls and I find the closest shop having them in stock, in Gothenburg. Almost back home again. However, in Fredrikshavn where I am at, there is a ferry to Gothenburg landing just a kilometer or so from this bike shop! I'll write this up on my lucky-list. If you haven't got it in your head, you must have it in your legs, and if you haven't got it in your legs, you need to have it in your wallet! Desperately trying to figure out what's wrong and hopelessly praying for an easy fix. The internal shifter cable snapped and seized up the shifter after five years of use. Anders of Veloform, probably the best bike mechanic in the world, fixes my dear bike.